Security officials at Dublin airport have launched an investigation after a passenger managed to board a plane carrying a knife. It is understood the ­passenger, who was bound for Cologne, was questioned for two hours by airport police after informing Germanwings airline staff he had accidentally carried the blade on board in his laptop bag last week. A spokeswoman from Dublin Airport described it as a one-off incident and an "inadvertent error on behalf of the passenger". It is not known how the man carried it through the extensive checks unnoticed. Dublin Airport Authority (DAA) said it has a policy not to not comment in detail on security matters. Meanwhile, the Irish Independent can reveal ­security queues in Dublin Airport have breached the 30-minute time limit just eight times over the last five years. The DAA uses an "automated technology" system to ensure passengers spend no longer than half an hour in the queue for security checks. It is understood this ­technology tracks the length of time that passengers carrying Bluetooth- and wifi-enabled devices spend in the queue. A member of the security team at Dublin Airport revealed there are sensors placed in the roof of the security area that record the time the device and the passenger enters and leaves the queue. The beginning of the queue has been redefined in recent years to the point as to where a person enters it, whether it is in or outside the security area, while the end point is where the passenger walks through the scanner to airside. This data is then independently audited and verified by the Commission for Aviation Regulation (CAR), which slaps the DAA with a financial penalty if the time is breached. Since the aviation ­regulator first began to monitor the ­security queueing system in both terminals at Dublin ­Airport in 2010, the DAA has been sanctioned for queues which exceeded 30 minutes just eight times - once in 2010, twice in 2011, four times in 2013, and most recently on September 13 of this year in Terminal One. "Regrettably, Dublin Airport breached the 30 minute security queue target set by the regulator on one instance on September 13th. "This was an isolated incident and the only time in the first nine months of this year that the airport did not meet the required target. "In the first nine months of the year, despite the 15pc increase in passenger numbers, the average security queue time at Dublin Airport was less than eight minutes and about four out of every five recorded times were less than 10 minutes." Monitoring the queue is part of CAR's quality of ­service ­regime and, if the time ­limit is breached, it "leads to a ­reduction in airport charges paid by airlines". "The foregone revenue is based on the number of days where the queue is longer than 30 minutes. The maximum forgone revenue is 1.5pc of the airport charges paid by airlines," it added. "Failure to achieve the ­quality of service target on one day would lead to forgone revenue of around €110,000." In 2013, DAA lost out on approximately €400,000. 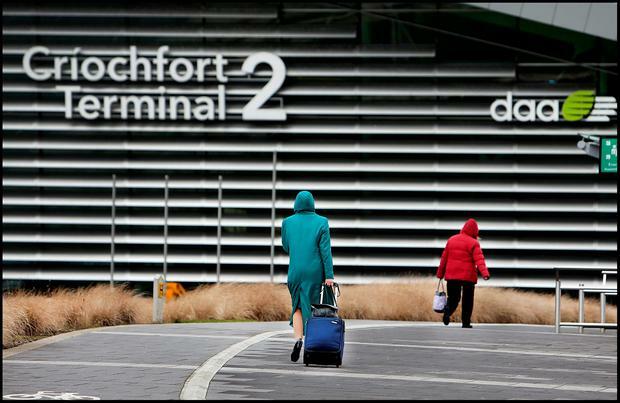 A spokesperson for CAR ­confirmed it ­"independently verifies and audits" the data ­collected by the DAA, which said CAR acted "as a watchdog" for service and quality measures regarding a number of areas at Dublin Airport. CAR said the queue-­monitoring system had been in place for five years. ­However, the automated technology system had been in place only since 2012. While there was no time breaches in 2014, it appears the highest maximum time ­passengers had to wait that year was approximately 15 minutes in January.